James Henderson, age 62, of Centerville, Iowa, passed away Tuesday, March 26, 2019 at Mercy Medical Center in Centerville. James was born on September 26, 1956 in Centerville, Iowa, the son of Earl Everett and Goldie Ione (Ray) Henderson. He graduated from Centerville High School with the Class of 1975. James was united in marriage to Mary Ann Hart on April 20, 1989 in Las Vegas, Nevada. In his thirties, James went to Auctioneer school in Mason City, and auctioneered for a few years. He was a custodian for the Centerville Community Schools for 13 years, and a custodian for Pella Windows for 10 years. In his earlier years, James loved being on the farm. He had a passion for fishing and going to Casinos with Mary Ann. 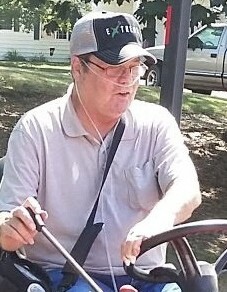 James is survived by his wife, Mary Ann Henderson of Centerville, his children, Scott Henderson of Washington State, Veronica (Ryan) Stober of Centerville, and Christopher (Misty) O’Hair of Centerville; five grandchildren, Ian Stober, Ava Stober, Oliver Stober, Logan (Fiancé, Nicole Seay) O’Hair, and Brooklyn O’Hair; four siblings, Bill (Linda) Henderson of Centerville, Barb (Steve) Sulser of Mystic, Debbie (Darrel) Barr of Melrose, and Lynn (Roger) Bennett of Stockton, Iowa; brothers in law, Rickey (John Conatzer) Hart of Phoenix, Arizona, Jeffrey (Debbie) Hart of Phoenix, Arizona, and Gary (Kimberly) Hart of Phoenix, Arizona; a sister in law, Sheila (Rick) VanBlaricon of Centerville; as well as many nieces, nephews and cousins. James was preceded in death by his parents, Earl and Goldie Henderson; and a baby brother, Gary Wayne Henderson. Per James’ wishes, cremation has been accorded. There are no scheduled services at this time. In lieu of flowers, Memorials have been established to EveryStep Hospice, and may be mailed to Lange Funeral Home and Crematory, 1900 South 18th Street, Centerville, Iowa 52544. Condolences may be shared online at www.langefh.com.